Joseph is one of my favourite Old Testament characters and not only because he is my namesake. As I read the story, it represents Triumph over Tragedy. Joseph’s Father, Jacob, was the 2nd twin son of Issac. It was Esau that came out of his mother’s womb 1st, and then Jacob. The Bible says Esau was a hairy man and Jacob was a smooth man. That brief description could have different meanings and implications, but for this report, it is limited to the physical description. Growing up, Esau was a mighty hunter, often away on the hunt, but Jacob stayed at home. Issac loved Esau, while Rebekah, the mother, loved Jacob. One Day Esau came back from the hunt empty handed and very hungry. Jacob had some food and Esau asked for some. Only if you sell me the Birthright Jacob demanded. In the customs of those Times some 4000 years ago, the 1st born male inherited everything, but in the line from Abraham, the Patriarch of Jewish, Christian and Muslim Faith, it also included the Spiritual Blessing that Abraham would be the Father of many Nations. Only looking back, can it be seen the Promise was kept to this very Day. For a temporary morsel of food, Esau sold the Birthright, even swearing an Oath to that effect. Esau and Jacob were young, and it was a smooth move by Jacob. Many years went by, and being the Blessed of God, Issac was very wealthy and powerful in the land. The inheritance and Birthright was very great, and the 1st born son got it all. At the end of his life, Issac was blind, and he called Esau to go hunt and make his favourite meal. Then he would get the material and Spiritual Blessing. After Esau left to hunt, his mother conspired with Jacob to deceive Issac, telling him to kill two young goats and prepare Issac’s favourite meal. Then they took the skins and covered Jacob so that he would feel “hairy” like his brother Esau.The deception worked, and Issac Blessed Jacob, thinking he was Blessing Esau. You can imagine how pissed Esau was when he returned to find out Jacob posed as him, and got the full Blessing. It was too late for him. It was a done deed even Issac could not reverse. Esau forgot he sold the Birthright to his brother so many years earlier, and wanted to kill him. 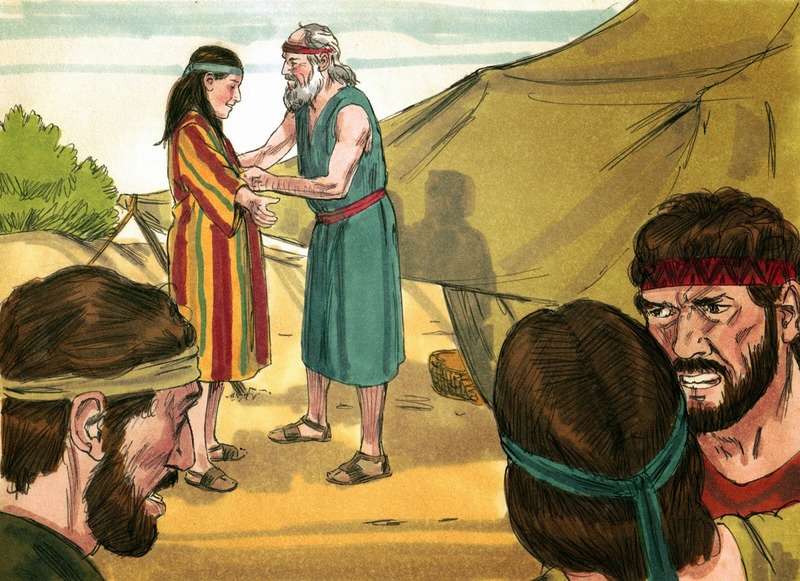 Jacob’s mother told him to go to her brother some distance away and hide out until Esau’s rage was over. After the 7 years, the wedding was set and the feast begun. Except Jacob was deceived like he deceived his father Issac. His Uncle switched Rachel for Leah, the older sister, and Jacob found himself married to a woman he didn’t love. The Uncle made Jacob an offer he couldn’t resist – work for him another 7 years, and Jacob could marry Rachel the following week and it was so. Leah, whom Jacob didn’t love, gave him 4 sons, the 1st Patriarchs of the 12 Tribes of Israel. Rachel, the woman he loved, was barren. Only God knows how many times they tried to conceive. In desperation, Rachel gave Jacob her maidservant to marry, to have children by her, and she delivered Jacob his 5th and 6th sons. Not to be outdone, Leah gave Jacob her maidservant for a wife, and she delivered Jacob his 7th and 8th sons. Then Leah delivered Jacob 2 more sons, now having 10, but the woman of his passion and love was still barren. Finally, Rachel gave Jacob/Israel his love child, his 11th, and named him Joseph.